Location: Poole Harbour, Dorset, England. Notes: After the Dissolution of the Monasteries, control of Brownsea passed to the Crown. Henry VIII recognised the island's strategic importance of guarding the narrow entrance to the expanding port of Poole. As part of a deterrent to invasion forces from Europe, the island was fortified in 1547 by means of a blockhouse, which became known as Brownsea Castle. In the following centuries, the island passed into the hands of a succession of various owners. In 1576, Queen Elizabeth I made a gift of Brownsea to one of her court favourites and rumoured lover, Sir Christopher Hatton. 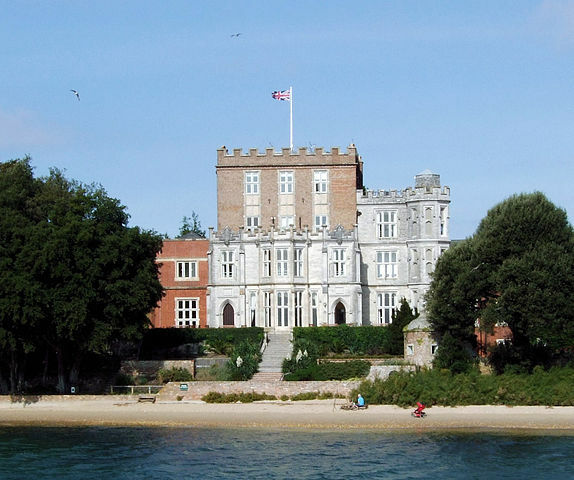 During the English Civil War, Poole sided with Parliament and garrisoned Brownsea Castle. Colonel Thomas Pride, the instigator of Pride's Purge the only military coup d'�tat in English history - was stationed on the island in 1654. Sir Robert Clayton, a Lord Mayor of the City of London and wealthy merchant became owner in the mid-1650s and after his death in 1707 the island was sold to William Benson, a Whig Member of Parliament and architect. He converted the castle into a residence and was responsible for introducing many varieties of trees to the island. Brownsea Island information at the National Trust.